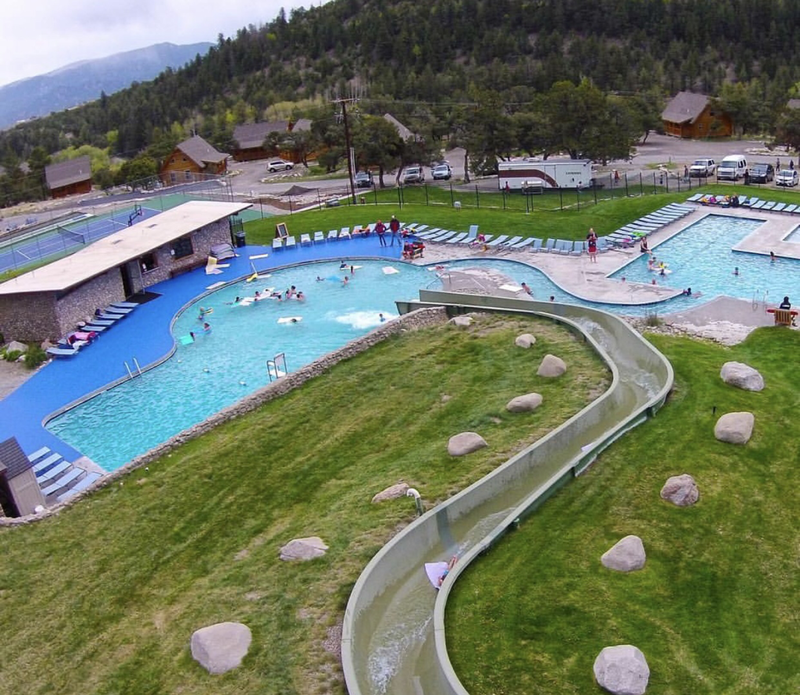 General Description: Mount Princeton Hot Springs Resort​ is a family friendly hot springs located along the Chalk Creek in the Gunnison National Forest in Chaffee County, Colorado. Mount Princeton boasts a historic bath house ​built in the mid 1800’s, three large cascading outdoor hot spring pools connected by a hot spring lazy river and three hot spring rock-walled pools. The Large Swimming Hot Springs Pool features a 400 foot hot springs waterslide. Location: From Pueblo, Colorado is 120 miles or about 2 hours and 20 minutes to drive to the hot springs. Accessibility: Mount Princeton Hot Springs Resort​​ ​is accessible. You can drive up to the resort. This is a large property. It is an easy walk around the resort. The facility has handicap accessibility. Hot Springs: ​Mount Princeton Hot Springs Resort boasts 3 large outdoor hot springs cascading pools, a bathhouse, and creekside hot springs. ​A must to do at Mt. Princeton Hot Springs Resort are the hot springs pools located right in midst of the cool rushing waters of Chalk Creek. Each pool is fed by its own natural geothermal hot spring that is bubbling up into the actual creek bed. The temperature of the creekside can be as hot as 120 degrees. of the Each pool is approximately one foot in depth with a comfortable sandy bottom. These creekside hot springs are seasonal depending on the spring runoff. The Pool temperature are 103 - 105 degrees. The large hot springs pool is 90 - 95 degrees and hosts a 400’ hot water slide. The water at Mount Princeton is treated. The water is not pure unless you are at the creekside hot springs. Clothing is not optional. Hot Spring Tips: ​Mount Princeton Hot Springs Resort offers day use for non guests. Hot springs access is included with accommodations. Accommodations include Creekside Suites, a Lodge, Cabins, and Hillside Rooms. No camping is offered. Mount Princeton serves up fine food and drink at their full restaurant and bar. 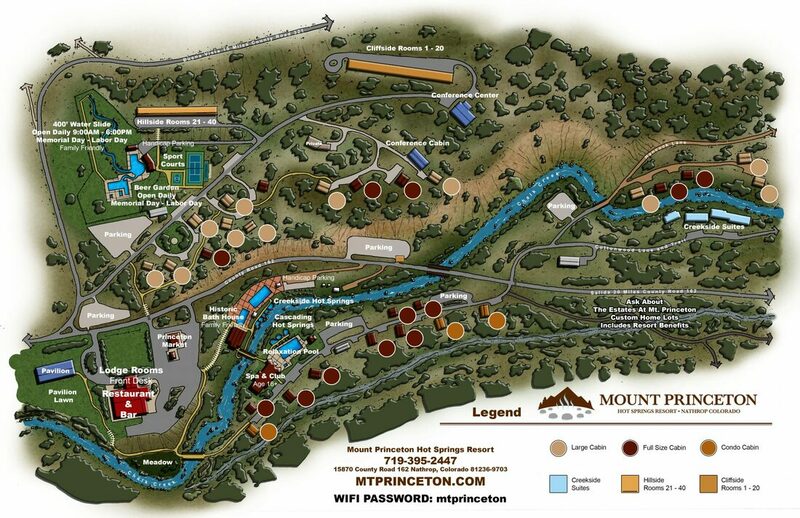 Mount Princeton offers a full spa and fitness center. Complimentary fitness classes and workout room for all resort guests, steam rooms, saunas plus guest and adult only hot spring pools. The spa is a full service including a juice bar and yoga. If you are low on supplies they have an onsite market. ​Mt. Princeton Hot Springs Resort is a smoke-free facility. This hot springs is pet friendly. Clothing is required. Bring your bathing suits. Youtube Video on Mount Princeton Hot Springs Resort is below.